In my hometown where I grew up there was bread factory. The smell of delicious fresh baked bread permeated the still early morning air. It was a stark contrast from the pungent aroma of rotten oranges emanating from the orange juice factory on the opposite side of town. Accompanied by the fishy stench from the ocean side. My experience with bread making has seen more failures than successes. Nevertheless I refuse to accept defeat. I now have a small arsenal of bread recipes. That despite my lack of talent tends to come out no matter what. In fact, the dough for Honey Whole Wheat Bread has never been the same every time I make it. Yet the final result is always the same. 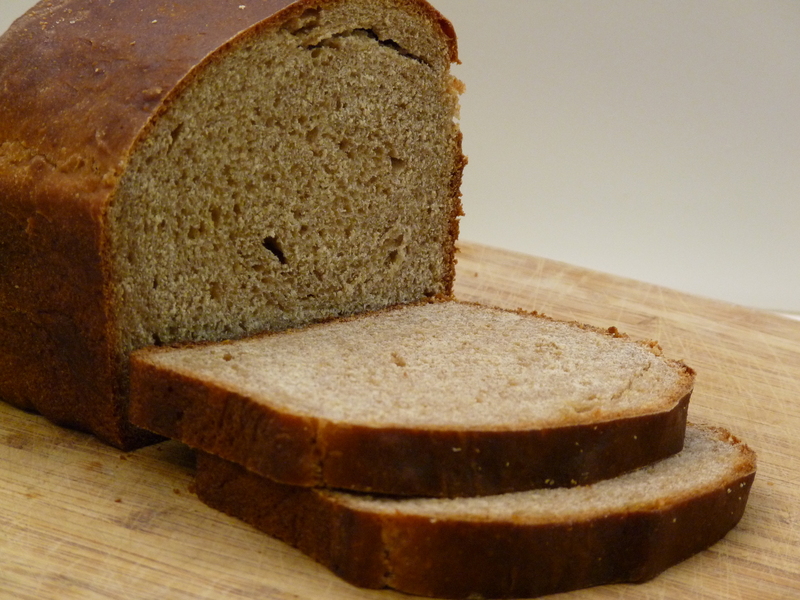 My idea of a good bread recipe uses minimal ingredients and is user friendly. This recipe accomplishes both. The idea of letting the sponge (wheat flour and water) rest for an hour is genius. No bitter flavor here. I read once years ago that honey was used in wheat bread to offset the strong flavor of the wheat. However, honey can also contain an overpowering flavor. So often my whole wheat loaves were bitter due to the combination of honey and wheat bran. In the King Arthur Whole Grains cookbook the recipe for whole wheat sandwich bread calls for orange juice instead of honey. They claim the OJ placates the strong flavor from the wheat. Still the recipe involves the additional ingredients of potato flakes and dry milk. These three ingredients were not a common staple in the pantry. Thus, the recipe did not meet my criteria for a good loaf of bread. This recipe yields a tender crumb and no bitter taste. Yet it is a hearty loaf. This is not a recipe for a light airy wheat sandwich bread. Divide the dough in two and shape the loaves. Place the loaves in greased bread pans, cover the pans loosely with plastic or in a large plastic bag, and set aside to rise again for 90 minutes.